Thanksgiving is almost here and now it’s time to quickly pack for a weekend away. Since it’s only a few short days, you want to make sure you pack light, only the absolute essentials, but you also want to make sure you don’t forget anything that you might need! 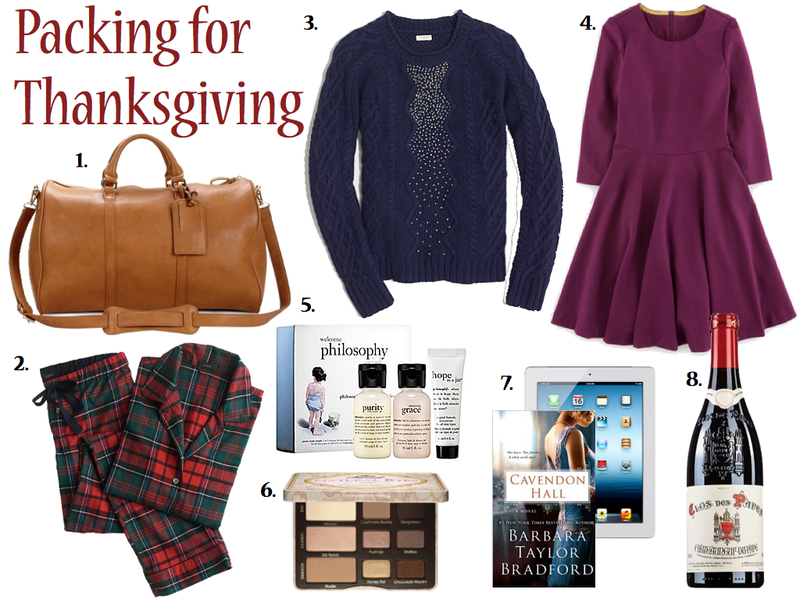 I thought I would share my Packing for Thanksgiving essentials and all of my T-day weekend away must-haves! 1. Weekend Bag – You’ll definitely need a weekend bag for your Thanksgiving break. Something not too small, but not too big to carry all of your essentials. This medium sized vegan leather bag from Sole Society is perfect for a quick weekend jaunt. 2. Warm Pajamas – I’m not sure about you guys, but my parents place is always freezing at night. The temp. practically demands the most warm and cosy pajamas known to man and I found that I really love the pairs from J.Crew. Their flannel pj sets are incredibly comfy, originally designed after boys pajamas, and super cosy, which is practically necessary for those cold nights. It will definitely bring you a bit of comfort when you slip into an old bed that is not your own during your T-day vacation. 3. Warm Layers – In the spirit of the warm pajamas, warm layers are a definite necessity when you are packing for Thanksgiving. You aren’t always sure what you’ll be up to, but it’s pretty certain at some point, you’ll probably be heading outside into the cold air. It’s great to be prepared with some cute and cosy warm layer favorites. 4. Comfy Dress – Now this may not be a packing essential for everyone, but I definitely find that during Thanksgiving weekend, I head out to at least one social event or fancier dinner. I meet up with friends who I haven’t seen in forever and we head out for a night on the town or there’s a fancy family dinner to attend that calls for more than jeans and a comfy sweater. I always find it useful to pack a comfy, yet classy dress for Thanksgiving weekend to be prepared for that situation. You never want to pack anything too tight since come Turkey day, you’re probably going to be eating your weight in delicious mashed potatoes and stuffing so having a dress with a bit of stretch is definitely necessary. 5. Travel Skincare – TSA does not care how much you love your current skincare regime so make sure to grab a travel set of all your favorites! This tiny set from Philosophy is only $10 and has a face wash, moisturizer and body wash. One thing I will be definitely be bringing home this Thanksgiving is my new Clarisonic Mia 2. It has been doing amazing things clearing my skin and it came with a cute little travel case so it’s easy to pack. 6. Too Faced Eyeshadow Palette – With traveling and makeup, it’s pretty ridiculous to bring all of your old favorites so I try to minimize by finding a palette that does it all. This Too Face Eyeshadow Palette has been one of my favorite for traveling. It carries both matte and sparkly shades that can be blended for day or night, making it the perfect thing for Thanksgiving dinner or Black Friday brunch. 7. Books/iPad – I actually can find it hard to fall asleep when I travel so I make sure I travel with plenty of distractions. I always prep my iPad with a bunch of new games to try or movies/tv shows to catch up on. I also tend to pack a few books for any weekend downtown. I just started Cavendon Hall, if you are a lover of Downtown Abbey then you definitely need to pick up this book! 8. Hostess Gifts – Even going over to my parents house for Thanksgiving, I still make an effort to bring over some kind of hostess gifts. It’s just a nice gesture to any person’s house that you stay at for a weekend. For my parents, it’s usually a bottle of wine that we could share at dinner together. I, myself, do not know too much about wine so I always make sure to head to a spot where they know what they’re talking about! What about you? What is one thing you will DEFINITELY be packing this Thanksgiving weekend? Love that sweater, so cute!! And those PJs look perfect for Christmas morning, so cozy! Love the jewel tones! Can't forget wine to make the dinner easier. Great choices! Philosophy products are my faves. That brown purse, and blue sweater both have my name on them… LOVE!! And I'm so thankful I don't have to pack to go anywhere for the holidays! Great list! I am packing for our trip tonight. Cannot wait! Great stuff to pack. Unfortunately we don't get to travel for Holidays. Most family is close by. You definitely can't forget the wine and the comfy warm pj's especially around this time. This is a great list, especially for me since I'm going home for Thanksgiving! Thanks for the tips! Sweater and Jammies!!! Can I have them please?! So cute! I'm flying out tomorrow (yes, on T-day!) so I'm packing a lot of these in my suitcase tonight! I'm with you on the hostess gift. Especially for big holidays where you know they've spent a ton of time in the kitchen, regardless of who it is! What a great list, a few of those items I would forget. I am most definitely a list making person or I forget EVERYTHING! I love his list.